The homeless on Skid Row were treated to a special Thanksgiving meal courtesy of the Los Angeles Mission, Wells Fargo Bank and Chef Michael Voltaggio, chef/owner of ink. and ink.sack, on Wednesday. Thousands were served at the midday event, which featured recipes created by Chef Voltaggio. Kirk and Anne Douglas, long time Mission benefactors, were the hosts for the event where they helped serve the meal. Earlier this year Mr. Douglas honored his wife with a $10-million donation to the Mission over the next 20 years. The Anne Douglas Center for Women at the Los Angeles Mission is named for Mrs. Douglas. 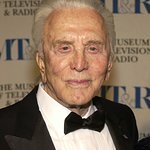 Among the stars joining Kirk Douglas at the event were Malin Akerman, Matt Bomer, Zachary Levi, Neil Patrick Harris, Bella Thorne, Blair Underwood, Bailey Chase, Mario, and Stephen Collins. The Mission was started as a soup kitchen for depression era men in 1936. Those who came to the Mission then would be very surprised at the quality of the food being served this Thanksgiving. The Mission still serves meals each day, and emergency shelter, but the primary work of the Mission in 2012 is helping men and women restore their lives and get back on their feet. Thousands have graduated from the program and gone on to life off of the streets. Many alumni were on hand Wednesday to volunteer. Wells Fargo Bank sponsored the event for the 6th year, with a $50,000 donation to the Mission to support its services to the homeless. More than 200 Wells Fargo associates joined other volunteers to serve the meal, clean tables, and serve in countless ways during the event. The Mission’s Thanksgiving event is a huge undertaking with more than 500 staff and volunteers working for months to get everything planned and in place. Three thousand pounds of smoked turkey were prepared by the kitchen staff, along with Chef Voltaggio’s recipes for 700 pounds of a Corn and Maple Stuffing (recipe below), 80 gallons of Country-Style Turkey Sausage Gravy (recipe below), 800 pounds of vegetables for the Parmesan Spaghetti Squash Casserole, Ranch Stuffed Baked Potatoes, CranApple Chutney and 400 Pumpkin Pies with Milk and Cereal. The stuffing was prepared with the assistance of Los Angeles Trade-Tech College Culinary Club students. The meal was served on a closed portion of 5th Street in downtown Los Angeles, the heart of Skid Row. Tents for serving were set up, along with specially decorated tables and seating. Thousands of guests from the community were seated and served the meal by volunteers from the community, from the entertainment industry as well as local political leaders. Numerous businesses and groups contributed to the event. U. S. Foods provided some of the elements of the meal, Landsberg Amcor provided the cutlery, plates and napkins, Tarps Plus provided and distributed 2,000 tarps, Icelandic Glacial Water provided bottled water for guests, Kimberly VoDang, Ms. America International 2011, provided and distributed 1,400 blankets, Morongo Band of Mission Indians provided turkeys, and PCL Construction made a financial donation. And for the 15th year students at Suzanne Middle School provided bags of candy that were distributed to the guests. The students collect left-over candy from Halloween, bag it into individual servings and the Mission hands it out at the event.